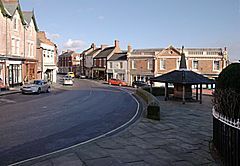 This page is about the Derbyshire town. For other uses, see Melbourne (disambiguation). 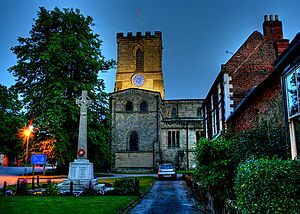 Melbourne is a former market town and civil parish in South Derbyshire, England. It is about 8 miles (13 km) south of Derby, 8 miles (13 km) north of Swadlincote and 2 miles (3 km) from the River Trent. The population of the civil parish (including Kings Newton) at the 2011 Census was 4,843. In 1837 a then tiny settlement in Australia was named after William Lamb, 2nd Viscount Melbourne, Queen Victoria's first Prime Minister, and thus indirectly takes its name from the village, this tiny settlement, would grow to become the second largest city in Australia and the capital and seat of the Australian Parliament from Federation in 1901 through to 1927, when the capital was moved to Canberra. The name Melbourne means "mill stream", i.e. the mill by the stream. It was first recorded in Domesday Book (DB 1086 Mileburne = mill stream) as a royal manor. A parish church building dates from around 1120. In 1311 Robert de Holand fortified the existing royal manor house to form Melbourne Castle, though the fortification was never completed. Jean, duc de Bourbon, the most important French prisoner taken at the Battle of Agincourt (1415), was detained at the castle for 19 years. Plans envisaged imprisoning Mary, Queen of Scots at Melbourne Castle in the 16th century, but it had deteriorated into a poor state of repair. By the early 17th century it had fallen into decay and was demolished, although some remains can still be seen. Melbourne Hall, originally owned by the church, was constructed in stages - mainly in the 17th and 18th centuries. During the Second World War of 1939-1945 a military training railway was operated to the north of the now defunct Melbourne railway station. Since 2005 Melbourne has run an arts festival every September. Melbourne parish church has been described as a "cathedral in miniature" and is one of five churches in Melbourne. The Domesday Book records a church and priest here in 1086. The present church was built about 1120, and most of the original masonry is intact, except for the eastern end which has been refurbished. The roofs, naves, aisles and the aisle windows date from the restoration of the 1630s. There was also a restoration done by Gilbert Scott in 1859-62. Melbourne Hall was originally the rectory house for the Bishop of Carlisle, but was substantially rebuilt by Thomas and George Coke in the early 18th century. The hall's gardens were laid out with the assistance of royal gardeners in 1704. They contain examples of the work of Derby ironsmith Robert Bakewell. Melbourne Pool was originally used by the nearby mill. The hall is open to the public in August. The Thomas Cook Memorial Cottages in High Street were built by Thomas Cook who started popular travel in England. Cook was born in Melbourne in 1808 though his birthplace was demolished in 1968. The buildings built in 1890-91 include fourteen cottages, a bakehouse, a laundry and mission hall. They still provide accommodation for some of Melbourne's senior citizens. Melbourne Market Place is the location of Melbourne's main shops, including the Co-op building and monument which was refurbished in 1998. The town contains many Georgian buildings and in the 19th century was a centre for framework knitting and footwear manufacture, e.g. Fairystep Shoes. Market gardens have always been a major part of the economy, though now only a handful remain. John Hair's brewery operated in Church Street from 1851 to 1954. East Midlands Airport, 5 miles (8 km) to the east of the town, was opened in the 1960s and has now become a significant regional transport hub. The town's bus service is run by Arriva Midlands. Previously, Trent Barton maintained a small garage in Melbourne, the site going on to become a supermarket. It maintained routes to Swadlincote, Derby, Aston-on-Trent and Weston-on-Trent. Bus services for pupils run to Chellaston Academy every morning and afternoon. There have been links to East Midlands Airport which were recently axed. Services in Melbourne include: Two ATMs, a post office, a pharmacy, a library, the Melbourne Assembly Rooms (formerly the Bill Shone Leisure Centre) and a youth club. There are also several pubs and restaurants. In March 2013 Melbourne was ranked as the 15th best town in Britain to live in by The Times newspaper, Melbourne Festival was also named as one of the Top 10 British Craft Events by Country Living. In April 2013 Melbourne became the first town in Derbyshire to receive Walkers are Welcome Town status. Melbourne, Derbyshire Facts for Kids. Kiddle Encyclopedia.